Paul spilled some coffee on the cuff of his shirt. Heather was wearing pants with cuffs. The doctor placed the cuff around Stuart's arm. The police officer took out her cuffs. The guard cuffed the prisoner. The tailor cuffed the trousers. Cuff dates back to the mid- to late-14th century. The Middle English noun cuffe or coffe orignally meant ‘mitten, glove or hand covering.’ Its origin is uncertain. Some linguists think it came from the Medieval Latin cuffia (cap, hood, helmet or head covering), which was borrowed from the Frankish kuf(f)ia (headdress), and can be traced back to the Proto-Germanic kupjō (cap), though others think it may have evolved from the Old English cuffie (hood or cap), which probably also came from the same Proto-Germanic word. It is related to the Middle High German kupfe (cap) and the Spanish, Italian and Galician cofia (headdress). The sense shifted to ‘band around the sleeve’ by the early 16th century, but has only been used to mean ‘the hem of the trousers’ in American English since the early 20th century. 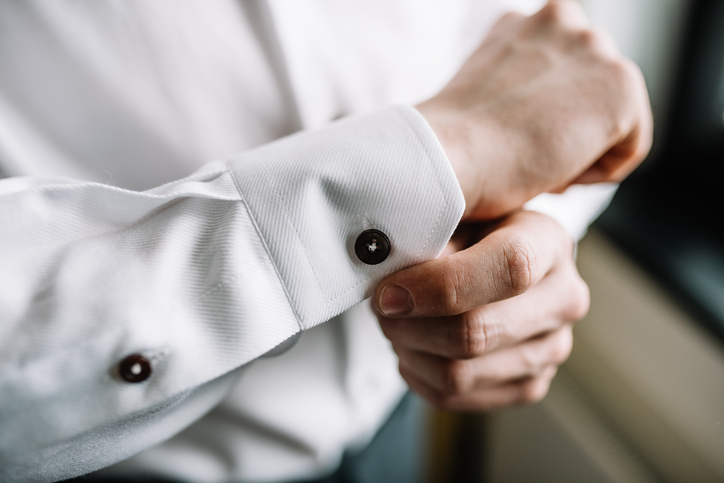 The expression off the cuff was first used in the US in the 1930s, and came from the image of an actor reading lines from the sleeve of a shirt, rather than learning them. The verb, meaning ‘to put a cuff on,’ comes from the noun and dates back to the late 17th century. Cuff, as a verb meaning ‘to hit,’ is unrelated. It dates back to the early 16th century, and its origin is uncertain, though it probably came into English from a Scandinavian source, possibly the Swedish kuffa (to push or shove).